The fashionable lady in Society required new clothes not only each year, but for each season and each activity. The less well-to-do usually had their clothing made over, or hired the services of a local dressmaker when in the country (and a lady’s maid had to be handy with the needle and up on the latest modes), but those with a significant income could lavish attention, detail, and money on their dress. 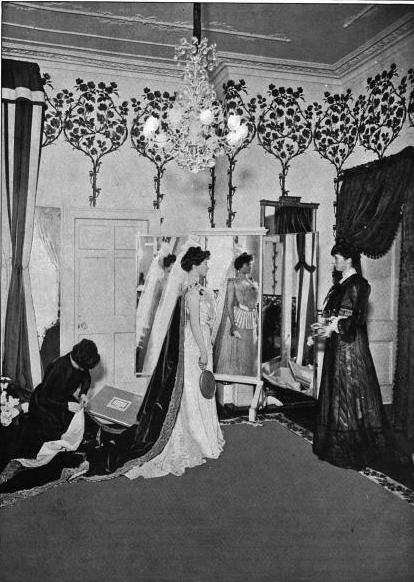 The smartest and wealthiest women nipped off to Paris, or visited the London branch of a Parisian salon, to replenish their wardrobe, but most ladies used the services of court dressmakers. Among the many establishments at the West End of the town, opened by a lady for the behoof of ladies, is Madame Kate Reily’s, of Dover Street aforesaid (Nos. 11 and 12). Her establishment on the east side of the street, noticeable from without for its modern facement of red-brick, and general architectural neatness, in respect of its internal economy, is very thoroughly looked after. Madame Reily herself supervises every detail of the management, and it is satisfactory to record that her work-people have the advantage of her personal oversight, which, judging from what we have seen of the Dover Street establishment, must be productive of beneficial results in the way of comfort and wholesome conditions of work for her employes. Considering the conditions under which some trades are to-day carried on, this is a point worth noting, and should appeal to the practical sympathy of women. Dress-making is a fatiguing labour at best; and it is well to know that is pursued under the most favourable conditions at Kate Reily’s establishment.